NOTICE: Activation key must be used on a valid Steam account. Requires an internet connection. 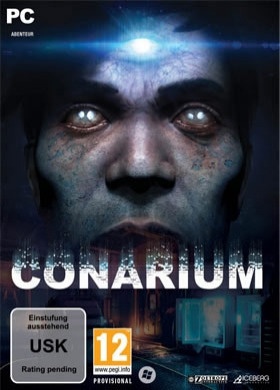 About the game Conarium is a chilling Lovecraftian game, which follows a gripping story involving four scientists and their endeavor to challenge what we normally consider to be the ‘absolute’ limits of nature. Inspired by H.P. Lovecraft’s novella At the Mountains of Madnes… s, but largely set after the original story. You, as Frank Gilman, open your eyes inside a room filled with strange, pulsating noises. Patterns of lights executing a Danse Macabre on the walls is presented by a queer device on the table. Having recalled nothing other than that you’re in Upuaut, an Antarctic base located near the South Pole, you find the place deserted and have a distinct feeling of something being terribly wrong. Somehow knowing that your memories cannot guide you enforces a strange feeling of vulnerability, a familiar yet alien sensation of being a part of a peculiar whole... Soon you will discover that having used the device during the expedition, you have died but then returned subtly changed, speaking of strange memories and of strange places. You have lost something important or gained something sinister... Explore the Antarctic base, as well as dreams and visions. Study clues, unlock secrets but avoid macabre beings at all cost. Powered by Unreal Engine 4, Conarium aims to bring cutting-edge visuals for a more immersive storytelling experience. Key Features A deep and suspenseful homage to H P Lovecraft with many secrets and Easter eggs. Ominous but wonderful graphics created using the Unreal 4 engine. Multiple endings. A haunting and atmospheric soundtrack. System Requirements Windows - Minimum OS : Windows 7 64-bit Processor : Intel Core i3-4160 @ 3.60GHz Memory : 6 GB RAM Hard Drive : 8 GB available space Graphics : NVIDIA® GeForce® GTX 480/570/670, ATI Radeon HD 5870/5850 DirectX : Version 11 Windows - Recommended OS : Windows 7 64-bit and above Processor : Intel Core i5-4690K @3.50GHz or AMD FX-9370 Memory : 8 GB RAM Hard Drive : 8 GB available space Graphics : NVIDIA® GeForce® GTX 960 or AMD Radeon R7 370 DirectX : Version 11 © © Conarium © 2017 Zoetrope Interactive. Licensed exclusively to and published by Iceberg Interactive B.V. Iceberg Interactive design and mark are registered trademarks of Iceberg Interactive B.V. Developed by Zoetrope Interactive. Microsoft®, Windows® and DirectX® are registered trademarks of Microsoft Corporation. All other brands, product names, and logos are trademarks or registered trademarks of their respective owners. All rights reserved. Made in Europe.